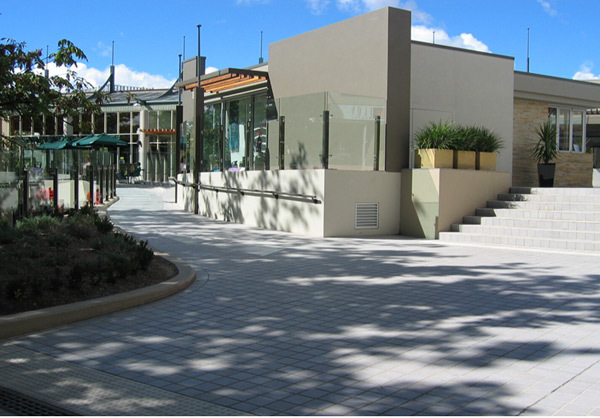 The project consisted of an extension and general upgrade to the upper floor of Manuka Plaza, including the construction of a new freestanding retail tenancy, to become “The Terrace” at Manuka. The demolition of a 17m high concrete clock tower structure had to be undertaken to make room for a structural steel framed extension to the centre courtyard, adjacent to the arcade, creating an additional 70sqm of tenancy space. A 70sqm freestanding retail facility was also constructed on a suspended curved concrete wall and slab structure. The demolition of the clock tower presented a challenge, as it was a 3-storey, reinforced concrete and steel structure, situated on a suspended slab above a retail area. Calculations involving loads, weight of machinery and reach of cranes were methodically carried out in order to ensure public safety.